Myopia, also known as nearsightedness, is the most common of all refractive errors. It is estimated that over 70 million Americans are nearsighted. Nearsighted people cannot see distant objects clearly. The most common cause of myopia is from an eye that is too long. This extra length causes light to come into focus in front of the retina. Since the retina only uses the quality of the image that reaches it, the brain receives an image that is out of focus. 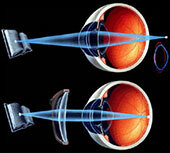 Nearsightedness can be corrected with glasses, contact lenses or refractive surgery such as laser vision procedures. Hyperopia, also known as farsightedness, is a refractive problem caused by an eye that is too short or a cornea that is too flat. When the eye is too short, the image is clear only behind the retina. When the cornea is too flat, it does not bend the light rays from near objects sufficiently to bring them in focus on the retina but the image is clear behind it. People with hyperopia cannot see things up close. Hyperopia can be corrected with glasses or contact lenses. In young individuals, the natural lens of the eye is soft and pliable. This flexibility permits the natural lens to change its shape, allowing it to focus on objects near the eye. As the years pass, the lens loses its flexibility and can no longer vary the focus of the eye. This condition usually becomes noticeable sometime between 40 and 50 years of age. People with normal vision up to that time find it increasingly difficult to focus on near objects, like words on a page or a computer screen, and need to wear glasses for reading and other close up activities. Simpson Eye has been providing eye care in the Northwest suburbs of Chicago since 1945. Our state-of-the-art medical and surgical offices are conveniently located in West Dundee, Crystal Lake and Huntley.